With its Triton line of speakers, including the flagship Triton One as well as the SuperSub X — which impressed us last year — GoldenEar has quickly gained the attention of value-minded audiophiles. The company’s slogan is “We make high-end affordable,” and while that doesn’t mean its products are cheap, GoldenEar aims to provide listeners more for their money. 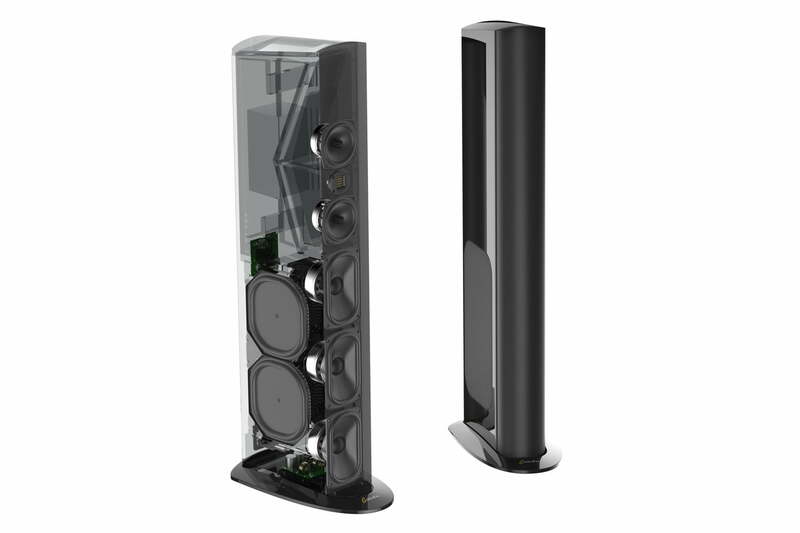 This year, the company is aiming even higher with its new Triton Reference loudspeaker. The Triton Reference begins to impress before it plays even a single note, with a striking one-piece cabinet and a hand-rubbed lacquer finish. The sleek skyscraper-styled look of the speaker may look simple, but there is a whole lot of audio technology packed inside. Though GoldenEar already had plenty of quality components produced for its other Triton speakers, everything inside the Triton Reference is new. This includes the active sub-bass drivers, upper-bass/midrange drivers, and high-velocity folded ribbon tweeter, all completely designed specifically for this new model. These drivers are matched with a newly designed crossover, as well as a subwoofer amplifier and 56-bit DSP control unit built on the technology used in the Triton One loudspeaker and the SuperSub-series subwoofers. The new 6-inch by 10-inch active low-frequency drivers have 40 percent more surface area than the drivers used in the Triton One, which combined with a larger voice coil and magnet makes for more full-sounding low end. On the high end, the new Reference High-Velocity Folded-Ribbon (HVFR) tweeter uses 50 percent more rare-earth neodymium magnet material than the company’s other HVFR tweeters, for better efficiency and improved transient response. To ensure that the Triton Reference speakers sound great with nearly any high-end amplifier, they offer a sensitivity of 93.25dB, which also aids in achieving excellent dynamic range. GoldenEar says that lows extend down below 20Hz, while highs can make it all the way up to 35kHz. The GoldenEar Triton Reference sells for $4,250 each, and the company aims to deliver the first models in spring 2017. The company is offering a first listen of the speakers this week at CES 2017, and Digital Trends will be there to take it all in. For more information, see the GoldenEar website.